NEWSFLASH: TTNZ have selected Ben Collins in the New Zealand Team to attend the Commonwealth Championships in Surat, India (Dec 16-21) – Congratulation to Ben! A good crowd turned up at Empire to watch the Winter Interclub Series Two finals on the 15th of September. The final of the Premier grade was between Titan Terriers (Ben Collins, Ricky Yeung, Lindsay Ward) and Waterloo Wasps (Hayden Tapp, Sean Hanson, Vance Kelly, with John Gan in reserve). Right from the first round of singles it was obvious that a win for either was not going to come easily. Titan edged ahead 2-1, but the first doubles quickly restored an even situation. The second group of singles again put the Terriers into a slender lead and a win in the second doubles gave a 5-3 lead in the race to 6 points. Probably the match of the night given the situation came next and was between Ricky Yeung and Sean Hanson and this went to the wire with little between them over five close sets, Ricky finally coming out on top with an 11-9 fifth set victory. 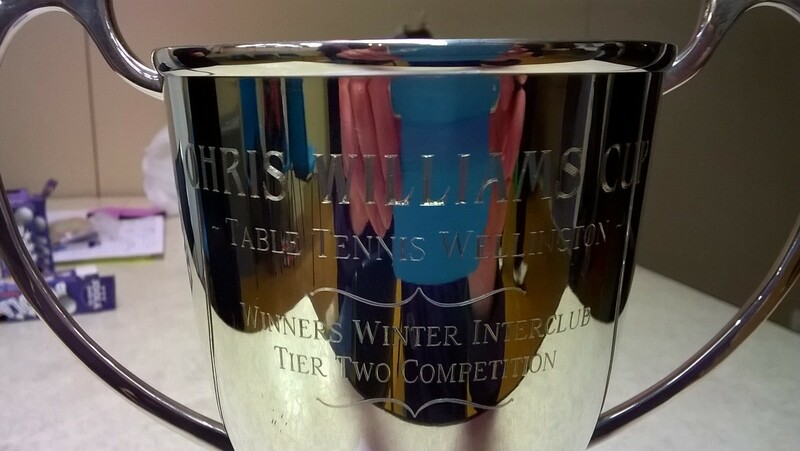 This made the score 6-3 to the Terriers and recipients of the Tommy Williams Cup once again. In another tough final, Waterloo Wolves (Gareth Telfer, Craig Gear, Scott Higham) played Empire Elders (Tony Rutledge, Bob Leeming, Bruce Connolly) in the final of Division One. Again there a number of early games which were close but the Wolves opened up an early 3-0 lead and at one stage led 5-1, with the Elders only win at that stage being the first doubles. Slowly though, the Elders fought their way back to only being 4-5 down with potentially two matches remaining. A good four set victory for Gareth Telfer over Tony Rutledge sealed the 6-4 win to the Wolves in a fixture which only saw one three straight match. The Wolves thus now hold the Chris Williams Trophy. In Division Two, Waterloo Whales (Ellen Xiong, Martin Xiong, Chris Sutton) played Empire Egrets (Graham Sole, Darrell Brown, Simon Jung). This was a good tussle although the Whales confirmed their favouritism with a 7-4 victory. Martin maintained his 100% record for the season for the Whales, while Graham Sole fought hard, achieving two wins, both to advantage in the fifth sets. In other matches on the programme, in Premier Empire Eveready beat Titan Trail Blazers 7-0 and Empire Energisers beat Waterloo-Titan Wanderers 7-4. In Division Two, The Combo beat Empire Eskimos 6-2 and Waterloo Walnuts beat Empire Echoes 7-4. Congratulations to all teams, particularly the three grade winners.